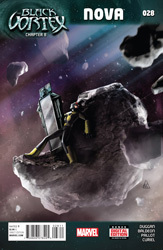 Note: This issue is Chapter 8 in the Black Vortex crossover event between Guardians of the Galaxy, X-Men and Nova. The story so far: The Black Vortex is an object of immense power created billions of years ago by the Celestials. The mirror-like device enhances the abilities of anyone who allows the Black Vortex to do so. An ancient race called the Viscardi destroyed themselves attempting to possess the Black Vortex. The planet's single survivor, Gara, used the device on herself but has now devoted herself to destroying it. Nova has taken the Black Vortex and is attempting to deliver it to the Guardians of the Galaxy while also resist the object's temptation. A week ago in deep space, Gara continues her search for the Black Vortex which caused the destruction of her race. She hopes to destroy it so the device can't fall into the wrong hands. 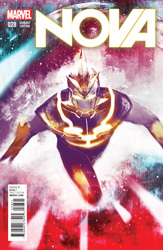 In the present, Nova is flying through space carrying the Vortex. The Black Vortex reminds Sam of when he was in possession of the Ultimate Nullifier. That experience has taught him to respect objects of great power even if he doesn't completely understand them. Looking at the mirrored surface of the device, the teenager sees a version of himself if he were to submit to its power. Sam asks the Vortex why should he accept more power when he can do so much already. In response, the Black Vortex shows him multiple scenarios of Nova with the enhanced powers including Sam saving his father and disintegrating Thanos. The Black Vortex even shows Sam the death of Rich Rider in order to persuade Sam that embracing the devices's power will prevent his own death. Sam begins to give into the device's promise of power. However, he musters the will to resist and remembers his Jesse Alexander telling him that nothing in life is free. Nova asks the Vortex what is the price for the power. Elsewhere, on Mr. Knife's Flying Fortress, Thane is having a discussion with the fortress's owner. Mr. Knife tells the son of Thanos that they must recover the Black Vortex if they want to have revenge on the Guardians of the Galaxy and the X-Men. Knife continues his deception and tells Thane that the heroes slaughtered his people in order to keep him from gaining the Vortex's cosmic power. Thanos's son reassures Mr. Knife that his resolve is unbroken and he will make them pay for their crime. Meanwhile back in Carefree, Sam hides the mirrored object under a sheet in his room. Without a solution for what to do with it, Sam uses his Avengers ID card to call the Vision for advice. The Avengers's butler, Jarvis, answers the call and informs Sam that the Vision is not available. The dejected teenager pulls off the sheet to look at the cosmic mirror one more time. The sight of himself as an immensely powerful Nova almost gives into the temptation. He finds the strength to resist when he hears his mother call him for dinner. At the table, Eva asks Sam what's wrong since he's acting odd. The teen says that he's just having a bad day. His mother explains that she's afraid of what he placed under the sheet since the previous item he brought home from space was a radioactive rock. Their conversation is interrupted by a knock on the door. Eva Alexander answers the door to find herself facing the Collector and his associate Legron! Sam runs from the kitchen to his room. After putting on his Nova helmet, he turns to find his sister peeking under the sheet at the Black Vortex! The high schooler grabs the device and flies off into space. The alien visitors follow him in their spaceship. The chase takes them around Earth's moon where Sam appears to be preparing to warp away from his pursuers. Suddenly, Nova stops and lets the ship fly past him! As the vessel goes in front of him, the Avenger damages its engine with an energy blast. Even damaged, the Collector's vehicle is able to continue its pursuit as the young hero opens a space warp to Spartax. On Spartax, Gara is speaking with the X-Men when she sense the approach of the Black Vortex. She flies off into space in an attempt to recover the cosmic object she's long been searching for. In orbit, Nova arrives at Mr. Knife's fortress believing the Guardians of the Galaxy are there. However, he is surprised to find Mr. Knife and Thane. The two villains immediately attack Sam demanding the Vortex. During the battle, Thane is able to grab the device and eagerly accepts the offered power! Sam Alexander now finds himself facing a very powerful, cosmic-charged Thane!